With the lights dimmed and the stage set, CHPS was ready to make its return to the Bay State after a brief hiatus. With a recent training in Maynard, NE-CHPS took back its place at center stage. Prior to 2014, Massachusetts had long been a pioneer and national leader in the construction of CHPS Verified schools. In fact, as of 2015 there were over 60 completed CHPS Verified schools and six Verified Leaders in the state. However, due to a lack of funding, MA-CHPS wasn’t adequately updated, causing the Massachusetts School Building Authority (MSBA) to remove CHPS from its sustainable design guidelines in 2014. As a result, CHPS faded from the spotlight in Massachusetts. Then, in 2015, MSBA updated its sustainable design guidelines yet again. This time, it included the recently updated NE-CHPS as a pathway for green, high performance schools. These re-written MSBA guidelines provide communities with the option to pursue LEED accreditation or CHPS Verification for school building projects. Also in the guidelines was incentive for projects going above the energy code by at least 15% - they would be eligible for a 2% reimbursement from MSBA. Following the announcement, NEEP, MSBA and CHPS partnered to host a webinar to spread the word of CHPS’s return to Massachusetts. In the months following the webinar, the need for an in-person CHPS training session became clear. Questions - What’s new in NE-CHPS? How does it differ from MA-CHPS? and How does it compare to LEED for Schools? – were widespread and needed to be addressed. This prompted NEEP to partner with CHPS and the Massachusetts Facilities Administrators Association (MFAA) to hold an interactive, in-person training in Massachusetts. Act I: Attendees gathered at Maynard High School, a CHPS Verified school located 25 miles west of Boston, on April 21 for a day filled with presentations, discussions, networking and learning. The training kicked off with a two-part technical session on NE-CHPS. Part One detailed recent updates to the criteria, outcomes of CHPS buildings and general information about the criteria. It offered an in-depth look at sections on indoor environmental quality, operations and metrics, water, energy and more. The energy section sparked interesting discussion related to energy codes and CHPS emphasis on designing above that code. This dialogue segued nicely into Part Two of the technical session, which focused heavily on the energy portion of the criteria. Attendees got a detailed look at how CHPS focuses on reducing energy consumption in schools by assigning a relatively high number (13) of prerequisite points to this category. New Buildings Institute’s New Construction Guide was noted as an option in NE-CHPS for achieving the prerequisite levels of energy efficiency. Additionally, this session identified some measures that improve energy efficiency in schools such as daylighting techniques, occupancy controls and natural ventilation. Act II: The next session deviated from the energy-heavy focus and offered two different (yet related) perspectives. First, was an intriguing session based on the perspectives of an experienced school facility manager. From the inclusion of lighting controls to often-overlooked concepts like ease-of-access of critical building systems, attendees left this session with a better understanding of the role of the facility manager and his or her staff. School design plans are developed with the best of intentions. However, like the snow removal example below, we often see that the way something is designed is not always the way something is used. In order to ensure the long-term success of a high performance school, it is crucial to include the perspective of the facility manager so that design plans match-up with maintenance plans. Secondly, two Massachusetts Department of Environmental Protection (MassDEP) Municipal Assistance Coordinators (MACs) provided perspectives on recycling and waste reduction best practices. This MassDEP duo briefly reminded us of the fundamental importance of recycling, something that can be easily overlooked but is important to acknowledge and pass on to school-age children. Interestingly enough, only 23% of all school waste is “trash” – meaning, 77% of waste can be recycled. The MACs highlighted important examples of common design flaws that inhibit proper waste management and offered best practices to ease operation and maximize recycled content. Act III: After lunch, the next two presentations were linked by one common thread - financing. The session entitled Debunking the Cost Myth that High Performance Schools Have to Cost More provided real-world, factual evidence that showed the savings made possible by constructing a school to high performance standards. The subsequent presentation, Missed Connections: Working with your local utility to fund school energy efficiency projects, described how utilities can fill gaps in funding for school projects. One funding mechanism, The Mass Save Program, collects funds from ratepayer bills and turns those funds around for customer use in the form of technical assistance and incentives. Representatives from National Grid and Eversource discussed the importance of engaging with local utilities early in the process to get the most out of their services. This presentation concluded by noting success stories from Massachusetts and Rhode Island school projects. Act IV: As was mentioned previously, the training event took place at a CHPS Verified school, and one of the most-well-received portions of the day was a tour of the facility. The group was led by the architects, facility manager and lead custodian on a detailed tour showcasing the various high performance features embedded in the design of the school. 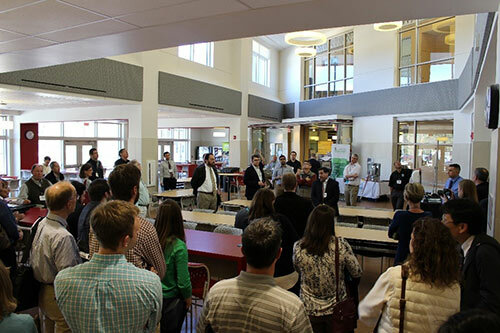 Tour-goers inquired about building materials, energy performance, lighting fixtures and more as the tour meandered in and out of hallways, the gymnasium, boiler room and other critical school spaces. Act V: A bit later in the day, after attendees found their way back to their seats following the school tour, we took a deep dive into IEQ and zero energy schools (part one and part two). The first portion focused on the components of indoor environmental quality, including thermal comfort, acoustical performance, lighting conditions and indoor air quality. NE-CHPS puts a very strong emphasis on improving these conditions to lead to desirable outcomes such as improved student learning, occupant health and overall occupant comfort. Following the discussion on indoor environmental quality, attendees shifted their focus to zero energy schools. Since the early days of zero energy buildings, when the idea was mostly conceptual, much progress has been made in the actual design and construction of these building types, especially in the K-12 schools sector. The first segment of this presentation offered guidance on creating a plan to get to zero energy including steps such as focusing on efficiency first (before renewables) and holding a zero energy workshop. The second portion of the presentation focused on the often-overlooked operations and maintenance piece of the equation. Integration of the facilities manager’s staff into the design team is crucial to the ongoing success of any building and especially important to zero energy facilities. Major takeaways from this segment included; selecting appropriate technologies for the operators and occupants, providing tools and resources to maintain buildings and developing a facilities operations plan. Act VI: The day concluded with an informal, round-robin discussion between audience members and presenters. This session served as a useful platform for attendees to direct questions toward presenters about obstacles they are facing to achieve high performance schools. The CHPS trainings in Massachusetts don’t stop here, however. With two more webinars slated for later this year, NEEP, CHPS and MFAA are securing speakers and providing virtual trainings to answer the lingering questions. Stay tuned for more details. NEEP, and especially the Buildings Team, would like to thank everyone for attending the in-person training at Maynard HS. Additionally, we’d like to give a HUGE thank you to our presenters, sponsors and exhibitors for making the training a great success. For more information on the training and for all presentation slides, visit the event site here.